First published in The Bellingham Herald as “American Muslims protest border detentions in Blaine” on July 12, 2011. Why are we Muslims demonstrating for our rights? What rights are being violated? 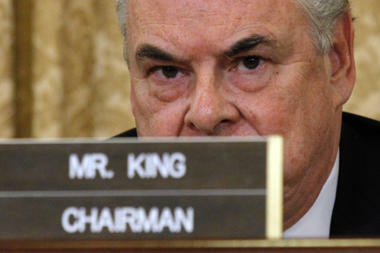 With great fanfare, Republican House Representative from New York’s 3rd Congressional District, Peter King, who is also the Chairman of the House Homeland Security Committee, convened a hearing with the title: “The Extent of Radicalization in the American Muslim Community and That Community’s Response.”. Republican Representative Peter King at the "Hearings"
There are so many ironies in this entire charade that we could all die laughing, if it were not so deathly serious. Rep. King is the same man who was an ardent and activist supporter of the terrorist Irish Republican Army, so much so, that when he was the Grand Marshall leading a St Patrick’s Day parade in New York, the Irish Republic refused to join the parade, as had been the tradition, citing King’s terrorist sympathies and work for the IRA. Referring to the civilian killings by the IRA in Northern Ireland, King said at the time, “If civilians are killed in an attack on a military installation, it is certainly regrettable, but I will not morally blame the IRA for it“.